Over the past 14 years working as a professional organizer and running my business it has become vivid to me that a majority of our clients have ADD. Our clients with ADD have a special need for our expertise. They count on us for expert advice and innovative solutions that fit their needs. We help them overcome the fear and anxiety that comes along with ADD. On numerous occasions our clients tell us, “I was so scared to call you. ” Or, “I am so ashamed of my mess and didn’t want anyone to see it.” I can assure you, over 14 years we’ve seen about everything and nothing will scare us or intimate our team of qualified and trained organizers. We provide enthusiasm throughout the process, goals that are achievable and most importantly, we do NOT judge or look at our ADD clients differently. Tonia has consulted with Dr. Larry Shadid, MD a psychiatrist in Dallas and has learned in working with several patients, standard organizing approaches don’t often work with ADD clients. 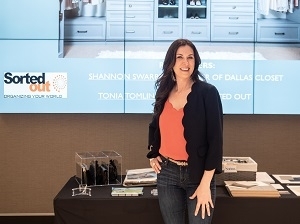 Sorted Out has come up with different organizing tools to help transition clients to get organized and stay organized. Taking charge of organization is one task and having ADD and getting organized feels like it’s a monumental mountain! I promise you, we will make it fun, yes we are kind of strange in that we think organizing is fun….We will get things done and organize with your needs in mind. It might take some time and you will get stuck at times, but we are here to help keep you on task and not let you micro organize everything, we will keep it simple and easy!